A doohicky, the name for something which you are trying to describe and can’t just remember the name of at the moment. Unlike the image below, I don’t use it to describe a person. 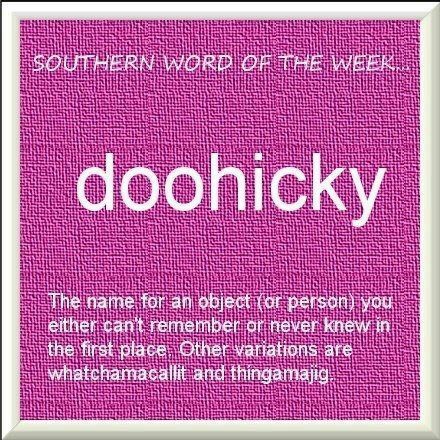 If not calling it a doohicky, I often call it a thingamabob, thingamajig or a thingy. In fact, I used it today when talking to my two co-workers when trying to describe something I needed to order from Staples. ” I need one of those thingamabobs to stack papers.” Also, known as a stack able paper tray, but my memory stopped functioning and all I could come up with was thingamabob. Clearly, these are popular phrases down here, so I’m not the only one who has those blank moments! Yep. Cattywompus is a southern word. It is on the list for Translation Tuesday… its a long list, I may never run out of material!